An earnest biopic of boxing's greatest championship, Ali captures the entertaining circus surrounding the man and the wider social context of his achievements, but not the essence of the human being. Starting in 1964, and set against the backdrop of the turbulent 1960s and the rise of the Civil Rights movement, the story of Ali is told through a series of episodes capturing the key struggles of his life: his fight to change his name and be accepted as Muhammad Ali rather than Cassius Clay; his shady and prolonged relationship with the Nation of Islam and notorious leaders like Malcolm X; his various relationships with a succession of women; and his multi-year fight with the United States government after his refusal to be drafted into the army, a struggle which went all the way to the Supreme Court and robbed him of more than three prime fighting years. Sprinkled amongst the personal history are excellent recreations of some of Ali's key bouts including, at age 22, his 1964 defeat of Sonny Liston to gain the world heavyweight title for the first time. The 1971 "fight of the century" against Joe Frazier also receives prominence, but more for the build-up rather than what happened inside the ring. The final 45 minutes of Ali settle down to recount the tale of the epic Rumble in the Jungle, the 1974 fight and media event hyped by the flamboyant Don King and sponsored by President Mobutu in Kinshasa, Zaire, in which Ali adopted the rope-a-dope tactic and ultimately defeated the brutal George Foreman to regain his title. 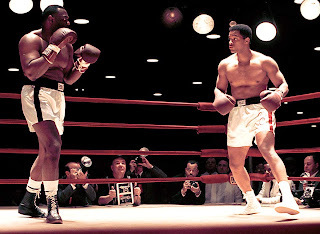 Despite the film's length of close to 160 minutes, and an excellent Will Smith performance, Ali's core and motivations remain mostly hidden behind the superficialities. The well known quotes such as "your hands can't hit what your eyes can't see" and "float like a butterfly and sting like a bee" receive plenty of exposure, as does Ali's adamant rejection of the name Cassius Clay, on the basis that it was imposed on his family by a slaver. But otherwise, Ali's personality is reduced to endless taunting of his opponents, and an acknowledged lack of self control with the ladies. The origins of the fires that drove him to success and the building blocks of his personality and boxing talent are conspicuously absent. 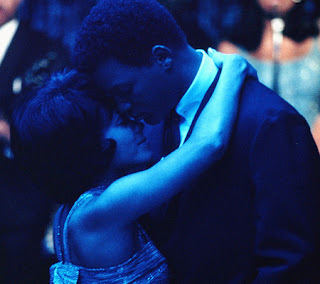 Michael Mann directs with respect for his subject and plenty of patience to allow the key chapters of his life unfold, while Will Smith gets into Ali's skin and picks up his distinctive expressions and mannerisms. But the movie is hampered by the absence of any compelling secondary characters, the committee of four screenwriters having to pump-up sportscaster Howard Cossell (Jon Voight) into an unlikely main figure in Ali's career. Cornerman Drew Bundini Brown (Jamie Foxx) and Malcolm X (Mario Van Peebles) also receive undue attention without ever connecting, while Angelo Dundee (Ron Silver) unfortunately remains a peripheral figure. Ali, much like its subject matter, enjoys many highlights and suffers through some lulls. The overall decision is a victory, but not quite a knock-out.